You are here: Virgin Islands News Online » News » USVI Men wanted for first-degree murder rearrested in prison! According to the release, on Sunday June 4, 2017, at approximately 2:40 P.M., the 911 emergency call center dispatched officers to a discharging of shots report at the Ruby M. Rouss Housing Complex in Christiansted. Upon the officers’ arrival to the housing community, they conducted a search of the area and observed a large crowd to the rear of the inside of an apartment. As the officers began making their way to the rear of the apartment, they encountered a male individual lying in a pool of blood on the kitchen floor with what appeared to be a gunshot wound to the head. The individual was eventually identified as Dean Schneider, 23. Mr Schneider succumbed to his injuries at the Juan F. Luis Hospital, according to Mr Dratte. Police officers transmitted via police radio that the suspects fled the area in a heavily tinted, unknown silver SUV, according to Mr Dratte. 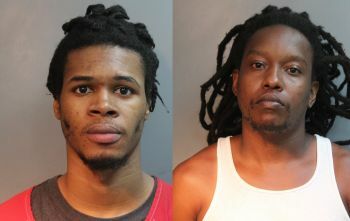 On Thursday, arrest warrants were signed by a Superior Court judge for K’Shawn Hughes, 20, and Andre Auguste, 27, for the murder of Mr Schneider, according to police. The warrants were executed by detectives on Friday. Both individuals have been remanded to the Golden Grove Detention Center pending their advisement hearing after failing to make bail of $1 million each. The VIPD is asking anyone with information about this crime to contact the force at 340-778-2211. Lol come on son you all shoot to INJURE we shoot to kill. Black males with no ancestral ties to the USVI.